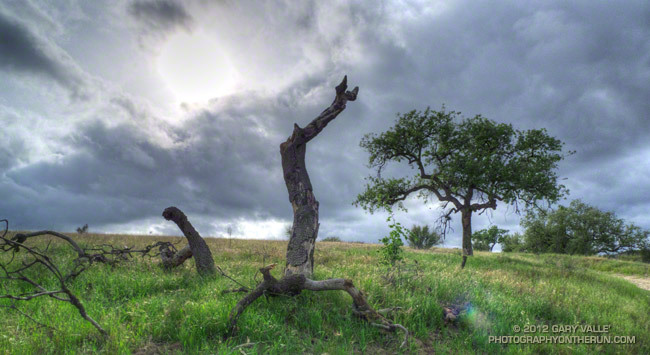 The collapsed tree above is number 75 of 80 dead oaks counted on a 7.5 mile loop encompassing much of Ahmanson Ranch. The trees were burned in the 2005 Topanga Fire. Most of the trees were valley oaks, but some coast live oaks were also burned. Most of the oaks in the Ahmanson Ranch area survived the fire, but perhaps as many as one in 20 trees were killed or severely injured. Of those that were severely burned, a small number, such as the valley oak above, attempted to replace its foliage through the process of epicormic sprouting. Oaks that lost all of their foliage generally survived in proportion to the number of epicormic sprouts they were able to produce. Those that produced only a few epicormic sprouts generally succumbed after 3-4 years. Oaks with numerous epicormic sprouts generally survived. Although Tree 75 didn’t make it, most of the surrounding trees survived the fire. And if you look next to Tree 75 you’ll see that its progeny, a young valley oak, appears to be doing well.